The stock 473 had 4 water tanks of 55 gallons each and 1 fuel tank of 55 gallons. With our intended plans we thought we would be OK with less water, but we wanted more fuel. 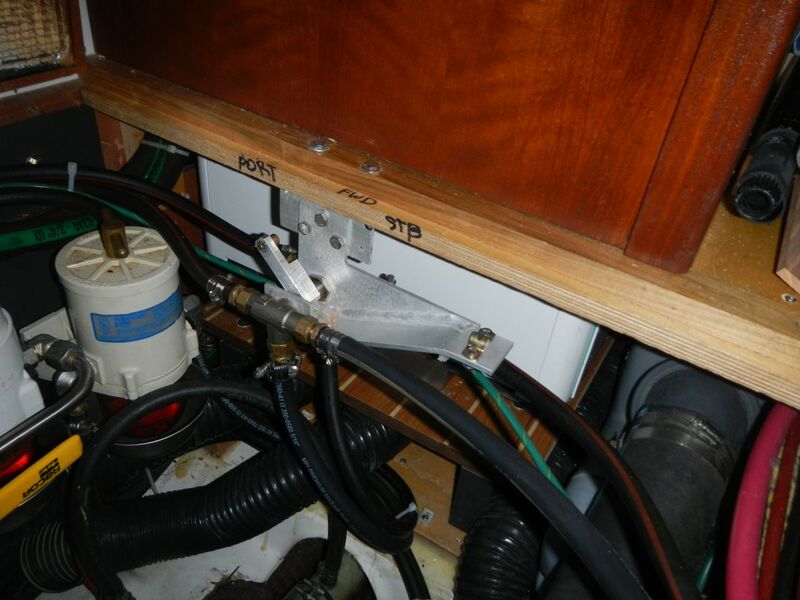 Beneteau offered a conversion of the aft starboard water tank to fuel as a factory option. I elected to order the factory kit from Beneteau. The kit included a new black plastic tank, fuel selector valve, fuel fill port, enough hoses to do the job, fuel level indicator, and ground wire. Although it cost about $2,200, it was a nice complete kit and worth the money in my opinion. I mounted the fuel selector in front of the generator. Beneteau included a control knob to switch tanks remotely, but I have not installed that. Pretty easy to just lift the access panel to the shaft log area and move the valve directly. 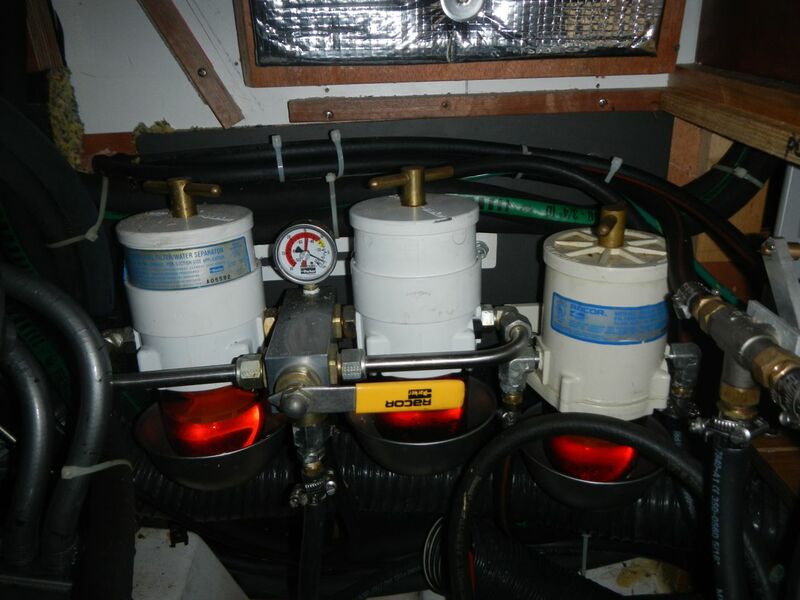 I also added a dual Racor fuel filter system for the main engine. This allows us to switch fuel filters on the fly if one gets plugged up. The 2 filters to the left are the main engine filters. The one to the right is the OEM filter which is now used as the generator filter. Since we have a water maker, this conversion has worked very well for us. 110 gallons of fuel and 165 gallons of water has been a real sweet combination. Just what I needed to see (one peak is worth a thousand scans) and hear. I’ll attempt to contact Beneteau for kit details. I love the fuel filter/selector arrangement complete with vacuum gauge. My gen-set is mounted in the aft starboard lazarette making servicing difficult. Since we are not getting shot at consolidating the fuel filters in a central convenient location promotes good preventive maintenance. Brilliant!